The Applewood Department Store is a very well appointed establishment overlooking the Village Square. With over 200 accessories including clothes, toys, books, display cases, a trolley, drinks, ice creams and chairs the store has lots of top quality merchandise and a café area. The Applewood Cottage will stack on top of the Department Store to create a 4 storey building. Alternatively, it is also possible to take the Department Store apart to make 2 single storey buildings side by side. Applewood Cottages could be stacked on both buildings to make a street scene. 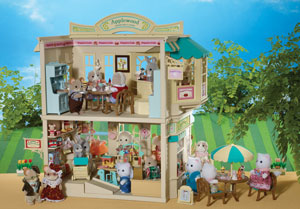 The 2 free grandparent figures are pre-packed inside the Department store and cannot be specified. Applewood Cottages and other figures not included.